Warning: Today’s Grommet is likely to cause cravings. If your experience with beef jerky involves the gummy, uber-processed, stomach-wrecking variety that’s a mainstay of all-night study sessions and long road trips, just toss those memories aside. Krave Jerky is so delicious and made from such high quality ingredients, even your butcher would be impressed. Based in Sonoma, Calif., Krave was launched by athletes who rely on healthy snacks to improve their endurance and performance. Founders Jon Sebastiani and Jens Hoj (right) believe you don’t need to reach for junk food when you need a boost. Their jerky is made fresh from sliced whole meat (beef, turkey and pork) and natural seasonings, and it’s like none you've ever tasted. Basil citrus, chili lime, curry beef, pineapple orange -- my mouth is watering just thinking about all the varieties. Even the skeptics in our offices were won over by Krave’s irresistible texture and sophisticated flavors. The next time you need an energy boost, skip the boring bars and chips. Krave’s jerky fills you up without overloading you with fat, calories or carbohydrates. It’s the tastier choice every time. Hi Daily Grommet. We started producing jerky because we are athletes who rely on healthy snacks to improve our endurance, performance and recovery. Our jerky has 50% less sodium than many popular brands and have only 70 calories per 1 ounce serving. They are loaded with iron, zinc, vitamin B and are 97% fat free. We didn't have to give up taste to put out a healthier jerky either as the team at Daily Grommet will tell you. 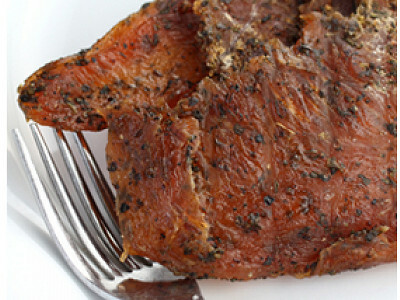 We know if you try some of our jerky you will be hooked. I am here to answer any questions that you have. Don't miss the details tab for today's feature - there is a lot of important information there. You can find the details under the video but above the story. There you will find the ingredient list and nutritional information for each jerky flavor, a listing of what is included in each assortment and other important information. We hope you treat yourself or someone you love to some exceptional jerky today. @Katherine Klinger: Sodium content is important to me; so 50% less is worthless information. Is there any way to find the actual sodium content? @Balmy: In the details area, at the bottom there is a link to each flavor's ingredient and nutritional information sheet. Sodium is listed there. As an omnivore who tries to be conscious, I'm wondering what efforts you've made to use only organically-fed, humanly raised animals in the production of your product. Thanks! We only use California raised cattle - and these farmers have made every effort to feed their cows a balanced diet of grass and grain. While we cannot guarantee an organic product, due to the extreme costs involved, we can confidently state that our beef are well raised. And as they, if cows come from California, they are Happy! @Jon Sebastiani: Thank you for your response and for doing what you can to use meat from animals who were treated humanely before slaughtered for our consumption - your consciousness is appreciated. This looks really interesting, but I don't eat pork or beef and you don't sell packs that are just turkey...bummer. @Diane: Jon put together another assortment for us to offer our community, a three-pack of the Basil Citrus Turkey. I might even go for the big bucks because they sound so good but I don't eat pork and I can't eat spicy. At some point will you allow buyers to pick and choose? @Marilynn Winston: We are looking into what we can do to allow you more ordering choices. Stay tuned. Update: we now have a three-pack of the Basil Citrus Turkey available. Enjoy! I love a good jerky, but this product comes in at $31.5 per pound - many times the cost per pound of a good steak in a regular supermarket. Grommet, please bring in items that are reasonably priced..
@schmitty: We would love it if you would help us scout out great Grommets at a great price. Whenever you come across a remarkable product from a company worth supporting, please tell us about it by clicking on the 'Suggest a Grommet' link above. We rely on submissions from our community to fill our calendar with wonderful discoveries. @Katherine Klinger: this is great to know. indeed, every once in a while i get upset over the price of some of the products you promote. wasn't aware you take suggestions. will keep on mind. *post edited due to content. Please keep comments appropriate. One thing to keep in mind when comparing prices of jerky per pound to beef at the butcher per pound, is that when you dry the beef/turkey/pork down, we reduce the weight significantly. So, depending the product it may take 3-4 pounds of meat to actually make one pound of jerky. Hope that helps explain the pricing question. I am wondering what the shelf life is on this. Is it ok to order Christmas presents now? I want it to be fresh. 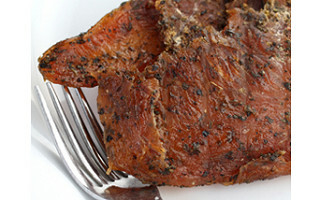 @Sally Dillon: We make our jerky fresh each month, and the usual shelf life is 12 months. So I think you are definitely safe for Christmas. 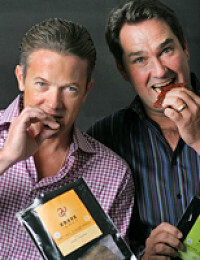 Many of our customers have commented on what a great gift our jerky is -- as opposed to the typical nuts and fruits.... Thanks and happy jerky eating! How much jerky comes in each package? @Jessica Denney: Each packet contains 3.5 oz of jerky. @Katherine Klinger: Thank you Katherine. Is this jerky the dry or softer style? I prefer the softer style. Thanks! @ Kathleen: The jerky is tender, soft and moist. We'll let you know when it's available. This jerkey looks awesome and I applaud your efforts to use good quality meat and ingredients. However I am disappointed to see your limited offerings (one flavor) for gluten and soy free jerkey. I also see artificial colors in the ingredients list. Why can't use you use safer, natural alternatives? As a health conscious individual I don't mind spending a little extra money on foods that are truly natural. I would love to see more varieties in the future. Thanks! Warning: Today’s Grommet is likely to cause cravings. If your experience with beef jerky involves the gummy, uber-processed, stomach-wrecking variety that’s a mainstay of all-night study sessions and long road trips, just toss those memories aside. Krave Jerky is so delicious and made from such high quality ingredients, even your butcher would be impressed. Based in Sonoma, Calif., Krave was launched by athletes who rely on healthy snacks to improve their endurance and performance. Founders Jon Sebastiani and Jens Hoj (right) believe you don’t need to reach for junk food when you need a boost. Their jerky is made fresh from sliced whole meat (beef, turkey and pork) and natural seasonings, and it’s like none you've ever tasted. Basil citrus, chili lime, curry beef, pineapple orange -- my mouth is watering just thinking about all the varieties. Even the skeptics in our offices were won over by Krave’s irresistible texture and sophisticated flavors.